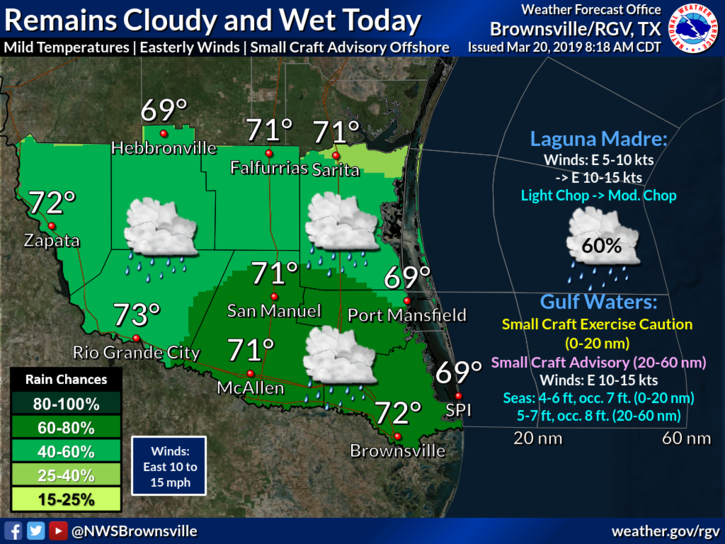 It will be cloudy and wet once more across the Rio Grande Valley on Wednesday, according to the National Weather Service in Brownsville. The winds will remain easterly today while afternoon high temperatures reach into the upper 60s and low 70s. Brownsville will see high of 72. McAllen and Rio Grande City will reach 71 and 73, respectively. South Padre Island is expected to be 69. Dangerous rip currents continue at the regional coastal areas, and there is a warning until 7 p.m. today. The National Weather Service warns beachgoers to swim near a lifeguard and to stay in water knee deep or less.